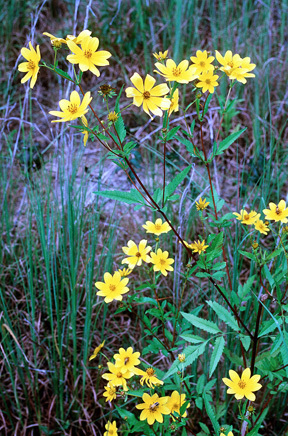 Bidens aristosa.Rick Mark.www.usi.edu (Accessed 12/2014). Bidens aristosa is an annual or biennial herb 30-150 cm tall. Leaves opposite, pinnately divided, 5-15 cm long including stalk 1-3 cm , leaf segments linear, toothed or lobed. Flowers: ray flowers about 8, yellow, 1-2.5 cm long, disk 0.8-1.5 cm wide, basal bracts of flower head linear, 0.5-1 cm long, outer bracts shorter than inner bracts. Fruit dry, 1-seeded (achene), flat 0.5-0.7 cm long, margins slightly winged, fringed with hairs, usually topped by 2 barbed awns; blooming and fruiting Aug-Nov.
Habitat: Partly shady sites in moist to wet soil, pH 5-7 (USDA 2006).